Of course, there are countless other ways we slashed expenses within our budget during that time as well, but those came down to prioritizing, and changing spending behaviors like: avoiding Target. As we got a few months into our debt snowball, we kept weighing the options on the above list and calculating our debt-free date if we took action on each of them. That was when things really started accelerating. Each item came with it's own amount of emotional struggles, but we didn't realize the emotional swing we would feel when we applied those things to our debt. The more we focused, the more we hated the debt and the bigger priority it became. But I always wondered what not contributing toward retirement for that short time was costing us in the long run. I never ran the numbers because I was scared to see it and we were just THAT focused on paying off debt at the time. So, let's take a look at some numbers, shall we? There are a multitude of factors that would go into this calculation, so I'm going to use some simple round numbers to paint this picture. Every financial situation is different, so if you are considering this, it's best to run the numbers for your specific scenario. Also, we didn't pull any money out of our retirement accounts, we simply stopped contributing into them. The money in there already stayed and grew in our account during that time. Let's look at the cost of not contributing toward retirement for two years. 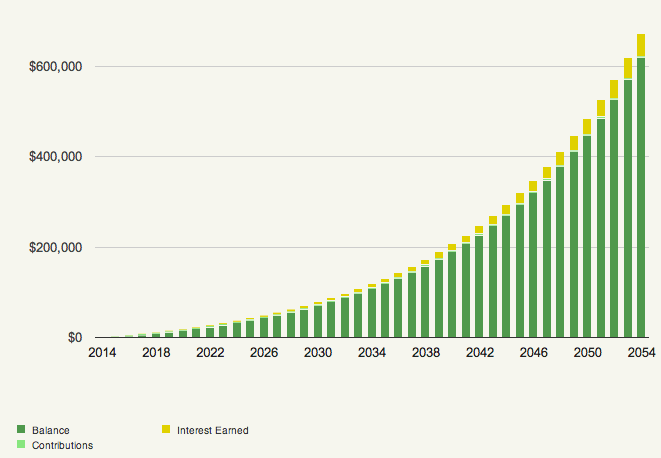 Assuming we're currently 25 (oh, to be 25 again... ah...) and planning on retiring at age 65 (40 years of investing). You'll see that with all things being equal and two less years to invest, we lose out on roughly $100,000 of retirement income. But there is a third scenario that we comes into play. And that is the change in behavior, education, and discipline that we built while focusing on paying off our debts. By focusing, we were finding an average of $1,739 per month in our budget to use toward paying off debt. We also knew that eventually we'd be getting back to contributing to our retirement accounts with more than what we were before, because our debt payments would be gone. 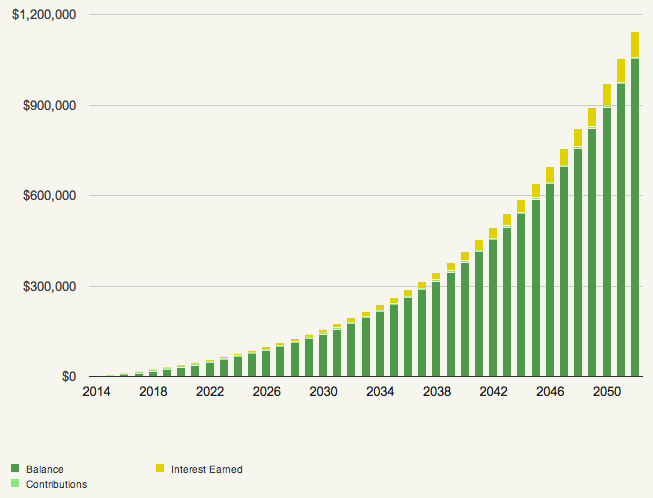 We'll end up contributing a lot more in the end, but at least it's not going toward debt interest. You're probably thinking. Man, that's not very exciting. Two years delay means I have to contribute twice as much to my retirement. Well, the reality for most of us is, we'll always wish we had started investing a few years earlier. It doesn't do a lot of good to worry about two years ago, what matters is today and moving forward. Also, don't forget that you've also nearly doubled your nest egg by doubling your monthly investment. And, you don't have the stress and complexity that comes with being in debt. You've paid them all off and your financial life is simpler! Who doesn't love simple? When you have debt and are paying interest, your giving away money that you could be investing. This is where focus comes into the equation. You can water down your approach and put just a little bit into retirement and a little bit toward paying off your debts, or you can get really focused on debt payments, and build the skills it takes to be really focused on investing later. What would happen if you had a $5,000 medical bill and you were watering down your approach by investing a little, paying minimums on your debt payments, and not much in savings. You'd likely have to borrow money to pay the medical bill and creating another minimum payment. Getting out of debt as quickly as possible and saving up for emergencies is a great way to put some buffer between the unknown things that might come up. It takes a lot of discipline to both invest, or to pay off debt. It's also a lot funner to invest than to pay off debt. But, we had to come to the point of accepting the responsibility for the debt we signed up for, and do our best to pay it off first before putting more money into investing. It came down to values and beliefs after we started paying attention to our finances. The discipline is why I'm OK with having to invest twice as much (or more) now and being debt-free. If we had the cash flow and no debt, I'd still want to invest as much as we are now, because that's what it's going to take to get where we want to be later in life. And, of course we still struggle sometimes. There are always ways we could be improving our finances. That's what keeps it interesting. We're never finished. We just keep moving and working and pressing and pulling to make everything work together toward our goals. And when we achieve a goal, there's always a new one to set. I'm curious, if you have debt, how does it make you feel? What do you think about paying it off before investing?